Holiday event season is around the corner, so now is the time to stock up on cute dresses and boots for your fancy parties! 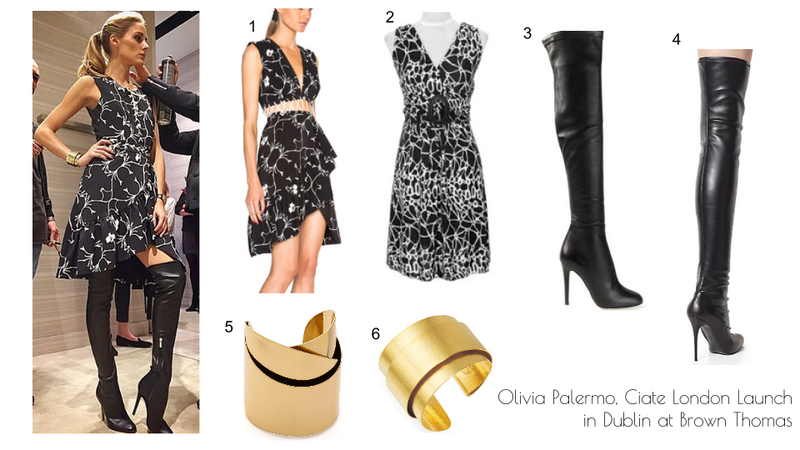 The black floral print mini dress Olivia Palermo wore at the Dublin launch of her collection with Ciate London at Brown Thomas is the perfect example of a party dress. I love the sophistication added with the gold cuff bracelet and the over-the-thigh leather boots. She looks very “Witches of East End-esque,” especially with the pose she’s striking. The original cuff bracelet is sold out, and the dress will probably sell out in a few hours, but here are a few alternatives below. The original pieces are marked with an *.